Document and visualize processes in minutes! TaskMap Professional combines simplicity for authors with the power of visualization and data connectivity in a single package. Updating process maps created with the system is also a breeze with TaskMap Capture for Excel*. TaskMap Professional includes new user-defined data fields along with fields to identify Risks and Controls. There are six new reports and support for Microsoft Office 2013 document types. 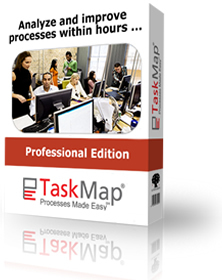 TaskMap Professional builds on the exciting data visualization capabilities of Visio 2010 Professional by providing pre-defined icons, text callouts and graphics that have been designed specifically for enhancing the presentation of process data. Add value to your process maps by adding visual annotations based on underlying data values. TaskMap Professional also makes it simple for you to customize the built-in data graphics. Don’t like the color? Click TaskMap Options to change it. Don’t like the position of the graphic? Move it to a new location. And if you need even more ways to display your process data, you can use Visio 2010 Professional’s Data Graphics to create hundreds of other types of visual annotation on TaskMaps. Data Linking means that you can connect your TaskMaps to external data sources such as spreadsheets, databases, and SharePoint lists. Linked TaskMaps allow you to move data into your maps dynamically — whether you are creating a map from scratch or refreshing one with real-time updates. And TaskMap Capture for Excel* makes it even easier by providing a pre-formatted spreadsheet with fields and dropdown lists for all Task data fields. TaskMap Professional Edition adds serious power – including sophisticated data visualization capabilities and the ability to link process maps to external data sources – all without sacrificing TaskMap’s renowned ease of use. Download the TaskMap Professional data sheet for a full list of TaskMap Pro’s data visualization and data linking capabilities. Secure, online payments can be made with major credit cards and Paypal. You will receive email notification of your transaction after payment. All our software products are backed with our RISK FREE 30 day money back guarantee. See why thousands are standardizing on our Visio based application and training courses.